This is the opening performance for the exhibition “HOPE?”, which was held in Seoul in South Korea. There is a poem ‘Foreword’ in a poetry book ‘Sky, Wind and Stars’ by Yoon Dong-joo. This poem of 9 lines was so popular among lots of people in South Korea that young people recited it as a slogan during the democratisation movement in 1970s. that has been given to me. Japanese translation of ‘Foreword’ is mentioned in a Japanese book entitled ‘Shi no Chikara ’[The Power of Poetry] by Suh Kyung Sik (Kobunken, 2014). According to the author, in the most popular Japanese translation of this poem (translated by Go Ibuki), the part ‘all things that are dying’ is translated into a Japanese phrase that means ‘all thing that are living’. 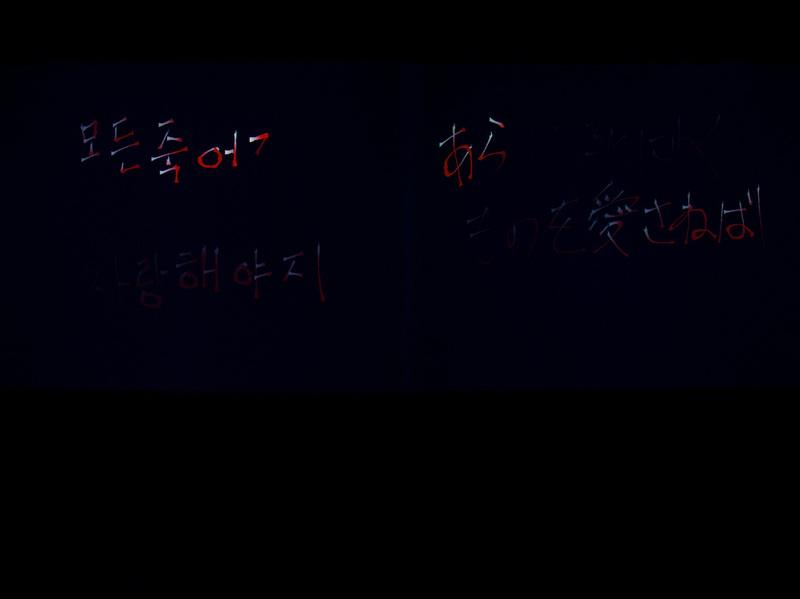 It is apparent that the original meaning is not faithfully translated into Japanese as the original poem in Korean language literally means ‘all things that are dying’. He says that the difference in how they translate this line reveals the deference between each countries in situation and attitude during and after World WarⅡ beyond the problem of translation technology and language ability and he clarifies the reasons in the book as well. (pp. 138-139) There is a monument inscribed with the poem ‘Foreword’ built in the Doshisha University, where Yoon Dong-joo had studied during his stay in Japan. The poem written in the monument is the one translated by Go Ibuki. 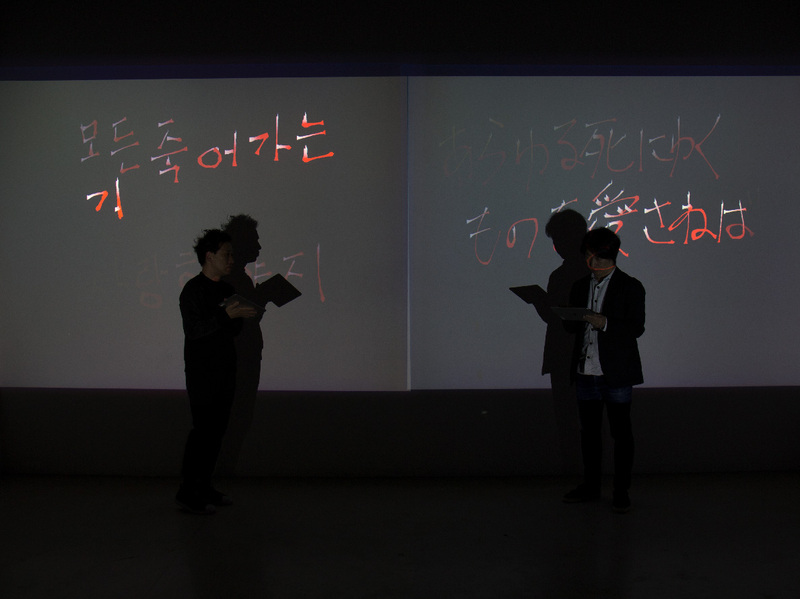 In the performance, firstly, men and women from South Korea, Japan, South Korean national living in Japan and Japanese national living in South Korea recite Yoon Dong-joo’s poem in Korean and Japanese language and the performance develops with their sound recording. 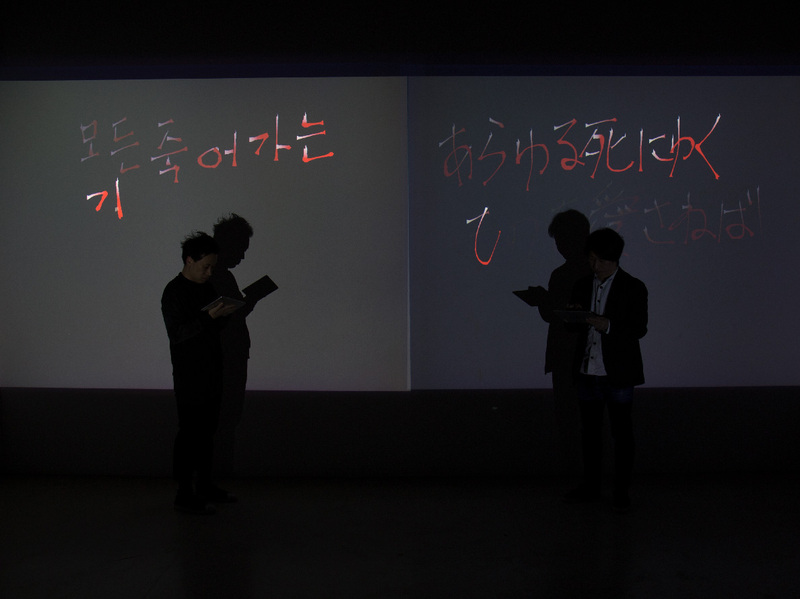 During the performance, two performers write one line from the poem at a time in Korean and Japanese in turns and their writing are projected on a screen behind them. While one line is written in Korean, the audience can listen to the sound of reciting the same line in Japanese and vice versa. The audience perceive literal and sound information mixed with Japanese and Korean language and the identification with a nation of the information becomes ambiguous. yusuke mimasu design all right reserved.